While buying my fabric for this week’s Iron Craft challenge, I was offered an extra yard of canvas red ticking at 50% off. How could I resist? Usually, when I get extra fabric like this it just ends up in my stash but, this time I came up with a project for it right away. 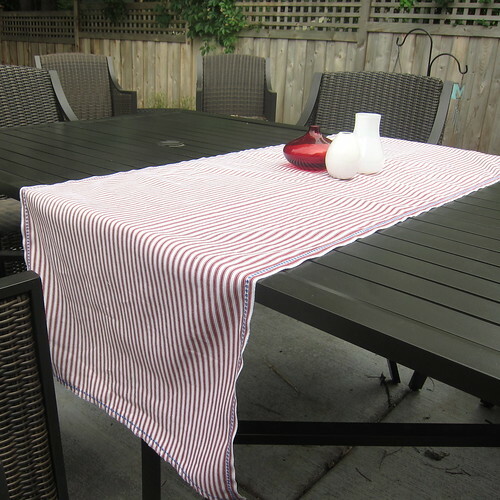 We’ll be having people over for barbecues at least twice this holiday weekend so, I thought why not use the fabric to dress up the patio table. I knew it wasn’t enough for a table cloth but, it would easily work for a runner. A runner is just what we needed to hide the fact that our table is actually two tables. 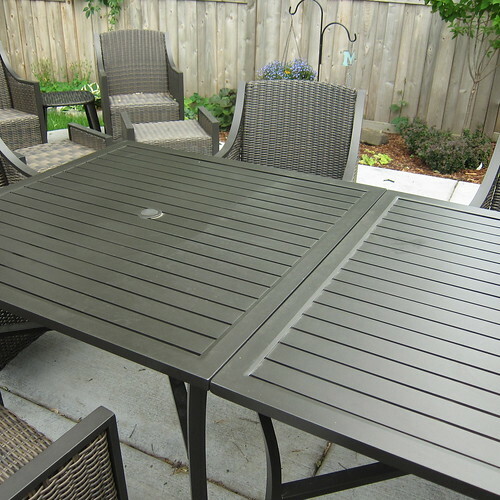 We couldn’t find one long patio table that we really like so, instead went with this set from Target and bought two tables. It gives us a lot of flexibility to seat lots of people. Now look, no more seam, it looks like one table. I really love the way it turned out. It’s festive and perfect for the Fourth of July without being over the top. I wouldn’t feel like I couldn’t use it other times during the year because it’s too themed. So, here are the details on the runner and how I made it. This is a super simple sewing project that, I think, creates a big impact. After removing the salvage and squaring up the fabric I was left with a piece that was about 44″ x 37″. I cut the fabric in half to create two 22″ x 37″ pieces. 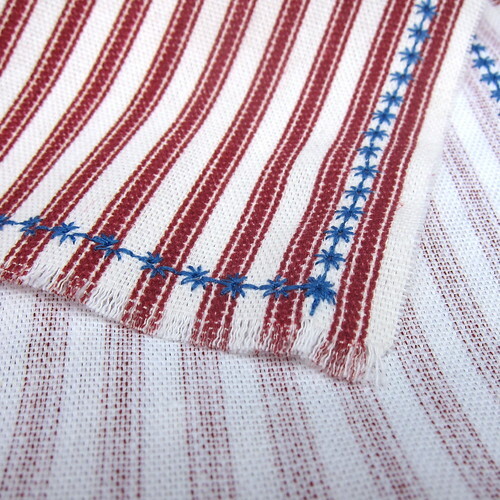 Then, I trimmed them to make sure the stripes would match up when I sewed the pieces together length-wise. The pieces were pinned together and sewn with a 1/2″ seam allowance. The final runner measures 21″ x 72″. After pressing the seam open, all that was left was the embroidery. I have a pretty basic sewing machine but it does a few decorative stitches. I thought this one looked like stars or maybe even fireworks. Even with a machine, it took a little while to get around all four sides but, so much quicker than hand embroidery. 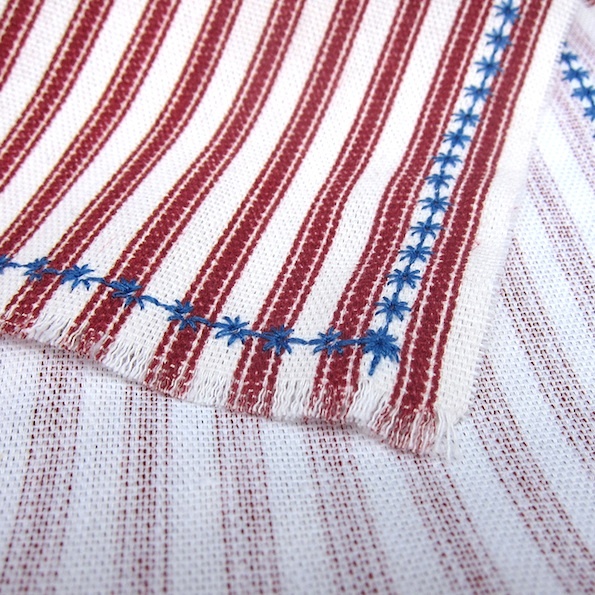 The embroidery caused some puckering around the edges but, a hot iron and steam took care of that quickly. Then it was just a matter of pulling a few threads from the edges of each of the sides to create a little fringe (yea, no hems!). Even though this fits the theme for this week’s Iron Craft, it is not my submission. You’ll have to wait for next Wednesday for that. This is Day 30 of 30 Days of Creativity though. I made it through all 30 days, woohoo! 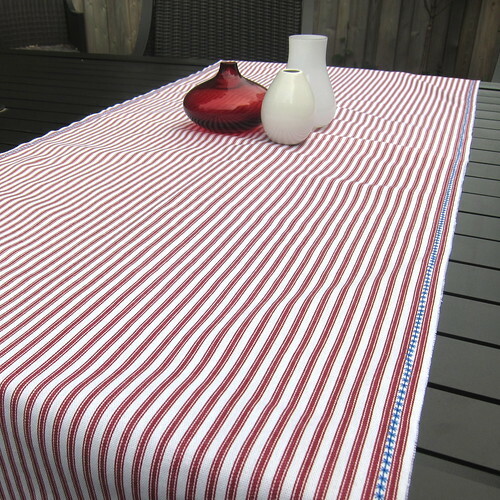 8 years ago by Kat in Challenges , Fourth of July , Holiday , Iron Craft , Needlecraft , Projects , Sewing , Sewing Projects | You can follow any responses to this entry through the RSS feed. You can leave a response, or trackback from your own site. That is fabulous, Kat! The stitching around the edges really makes a huge difference. I like it a lot! I agree, it's not too themed to use during the rest of the summer. Vanessa – I'm lucky my machine shows the stitches on the front, then you just type in the number & it tells you what foot to use…so easy! I love it! I need to remember to use the decorative stitches on my machine more! crazy good…just awesome! And I'll need to remember your idea about the two tables!